Wedding bells are ringing louder and preparations must be done soon! 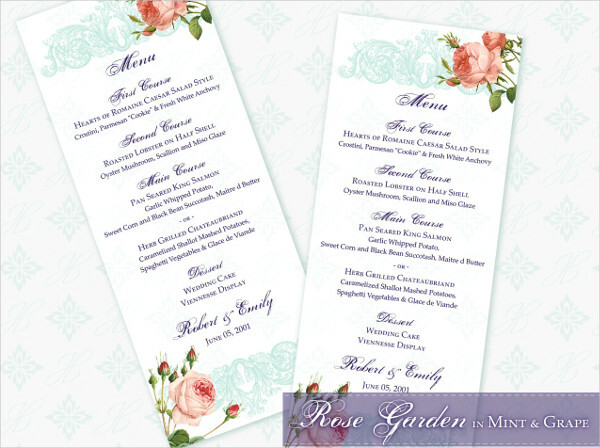 One of the many printouts that you need during the reception are the menu cards. 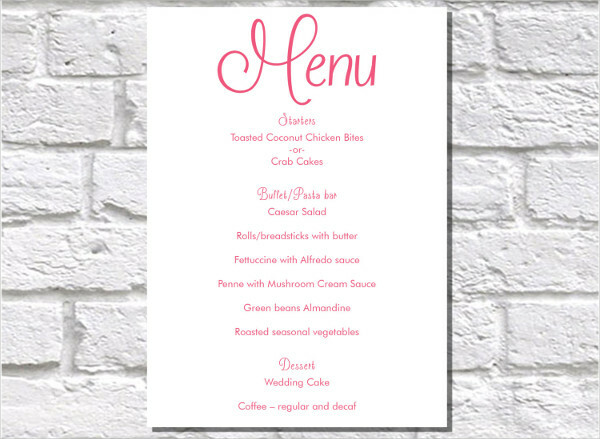 Like any other event, you need a party menu template for your guests to know what you have for their appetite. 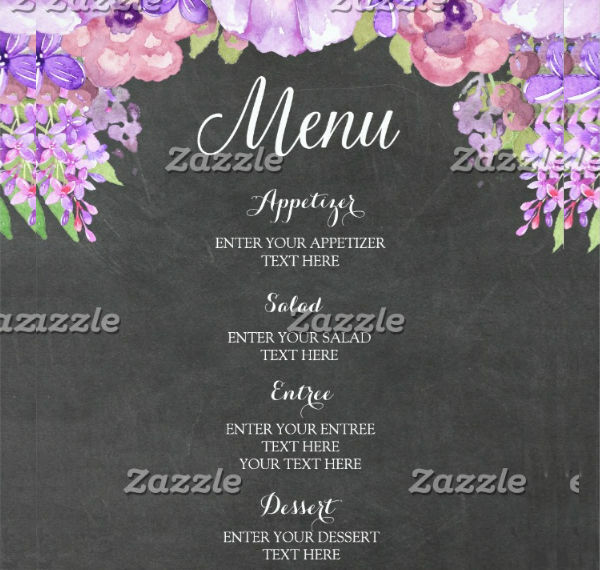 When searching for wedding menu, you can also check out an event menu template for more ideas on which details to add and how to write it. There are different styles and types that for you to use on your big day to make it more outstanding. 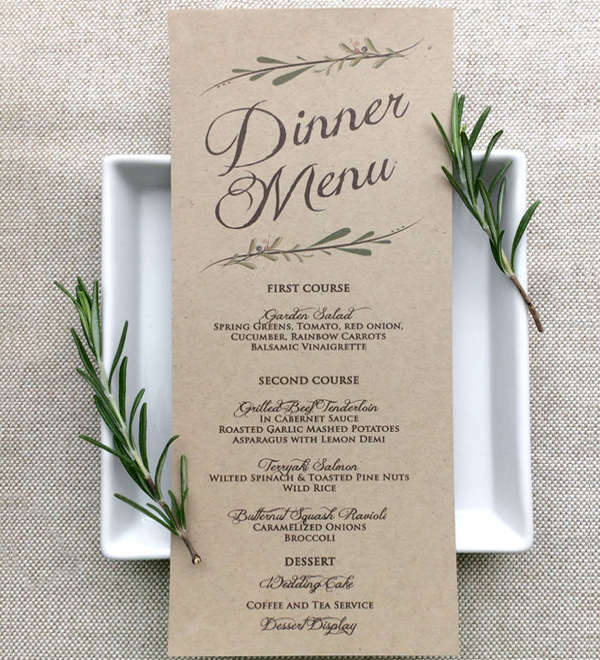 How Should Wedding Menus Look? 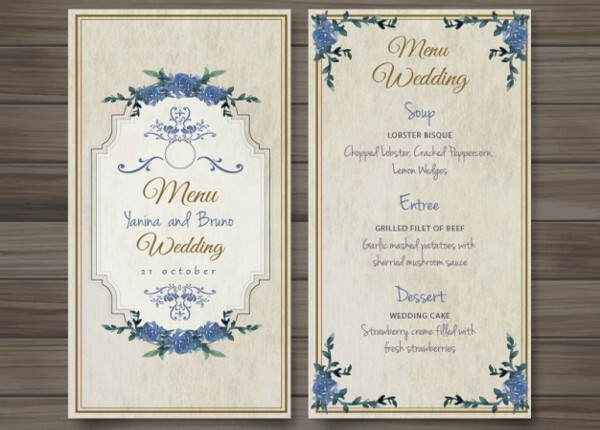 How your menu looks like depends on your wedding theme and motif. You wouldn’t want to use contrasting themes for both. 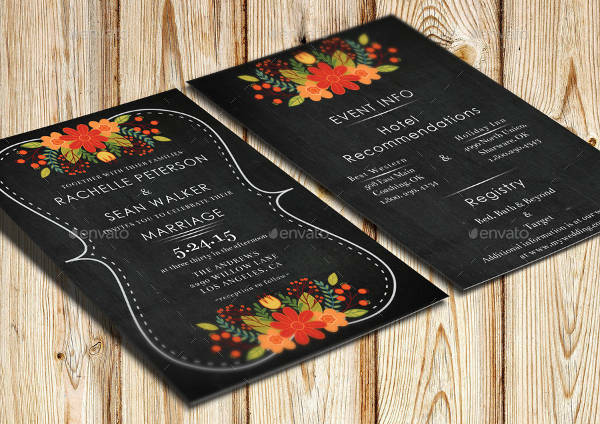 But, you can also use all-around themes like chalkboard wedding menu template that can match almost all wedding motifs, which make it easier for you to use wedding menu cards. Choose styles that fit you most from the list below and download now to get started. Minimalist Menu Template – this is a simple style with basically a plain background with very minimal font style used in the text. Some designs have borders on it while others don’t which keep it clear and easy to read. 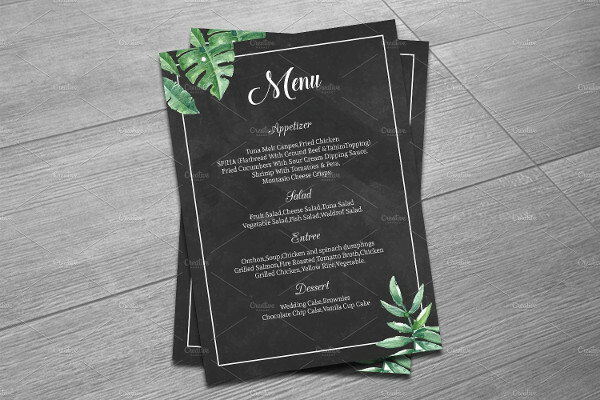 Rustic Menu Template – if you want something more natural-looking with designs rooting from nature, rustic style is best to use. One thing about this is that it can be a good representation for fresh ingredients on your food because of its earthy vibe. 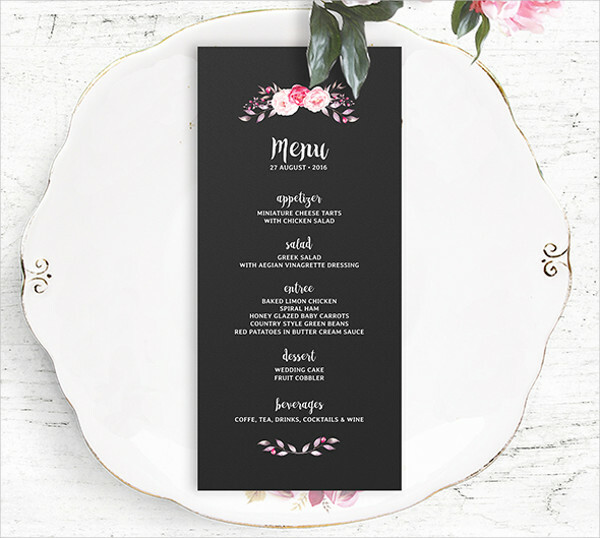 Vintage Menu Template – old-school style with the traditional format is what vintage menu is all about. 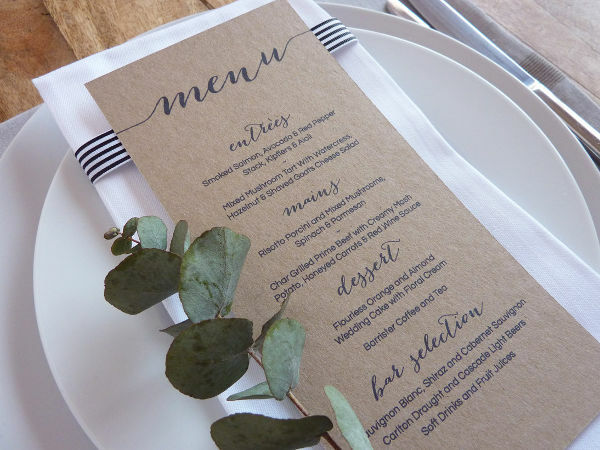 Like any other cards, wedding menu cards as well have certain dos and don’ts to follow. The general idea of making a menu is simple. But, putting it into a decent card can be quite tedious for some. 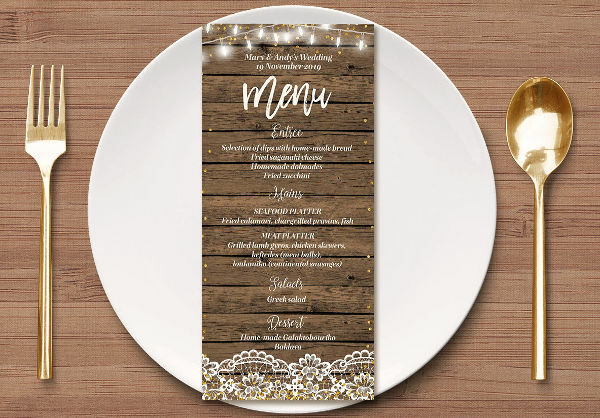 Initially, you can download a wedding party menu template that you can use if you don’t want to create your own from scratch. 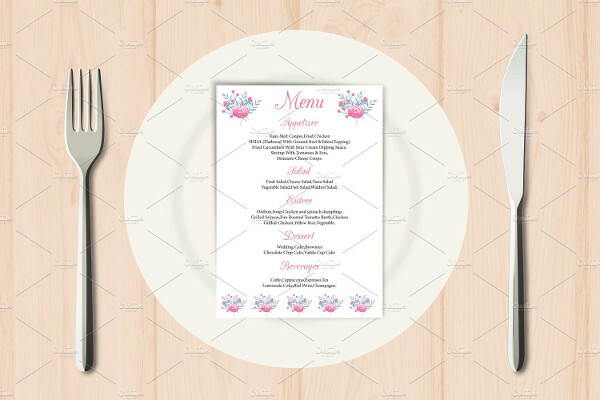 Other options include buying a ready-made menu card that you can fill-up manually, at the cost of more money, effort, and time. Organize the dishes for each meal course: appetizer, salad, soup, main dish, side dish, and dessert. It will be easier for guests to see which ones would be served first, next, and so forth. Write key components for the dish, such as pork, beef, chicken. Guests who have allergies and dietary restrictions will be able to identify what they can and cannot eat through the listed ingredients. Use sturdy paper or put the menus on stands so they won’t easily get discarded during the party. 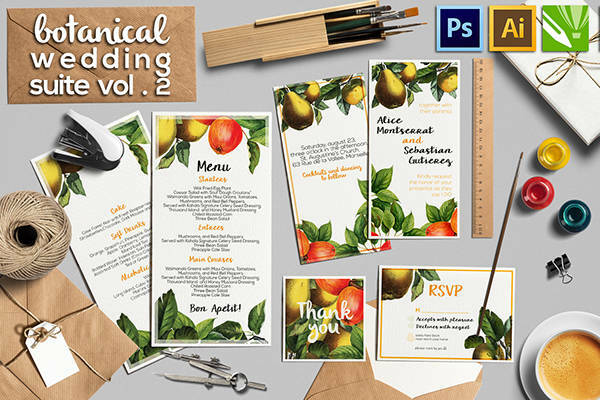 If you don’t want individual menu cards on the tables, at least one dinner party menu template per table will suffice. Do all the planning on your own. It will take too much time that you can use in preparing other details of your wedding. Get a helping hand to assist you. Forget to add beverage option for guests. 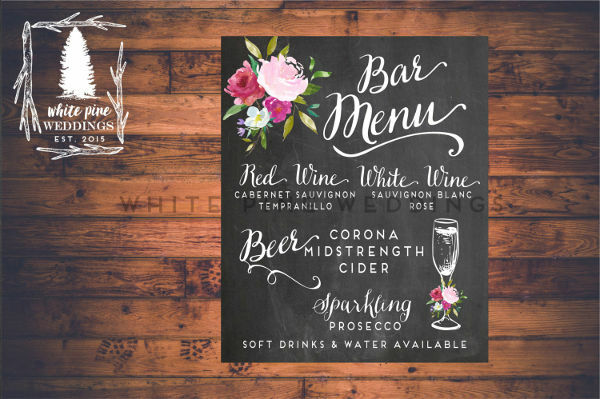 Part of a menu is the drinks that guests can order during your wedding. If you only have one option, state it there so guests would know. 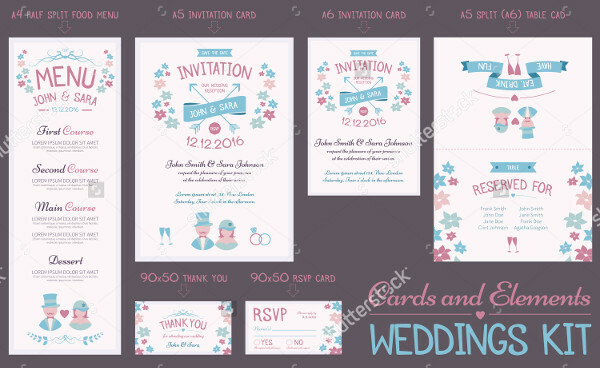 Overdo your card with the designs you want to add. 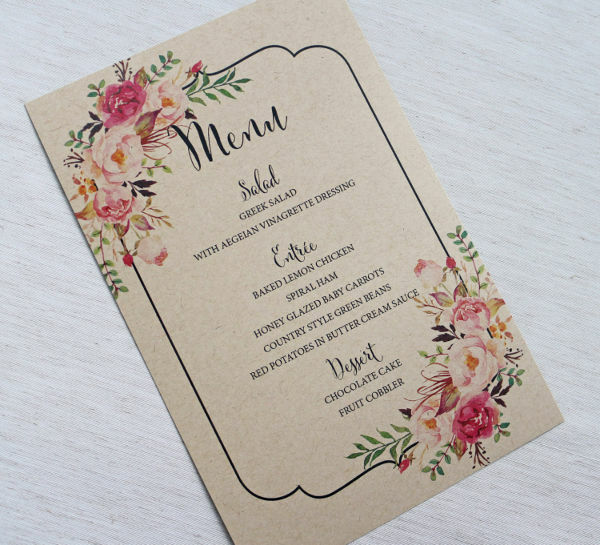 Keep everything clutter-free by distributing the content of the menu evenly on the space of your invitation. Borders are acceptable accents to your menu cards. 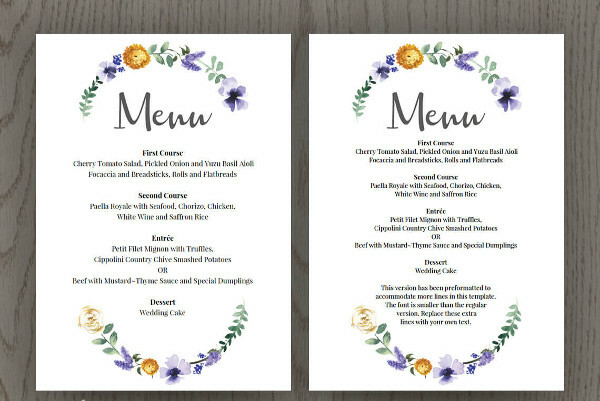 Why Use Wedding Menu Templates? 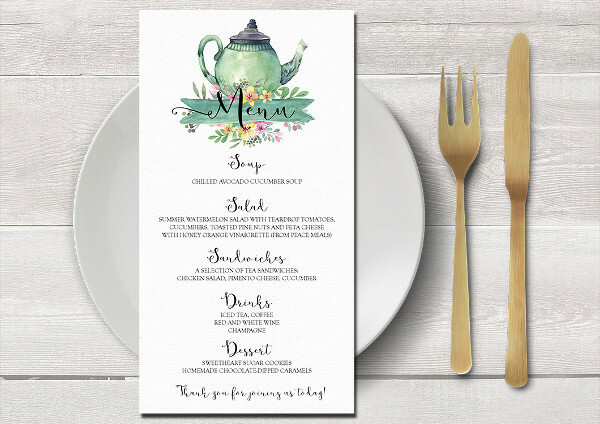 It has probably crossed your mind that you can just print out a list of dishes that will be served at your wedding and not make a wedding menu. But, the thing is, the menu makes everything more formal. Another thing is that they can be easily placed in front of your dishes or on each table. 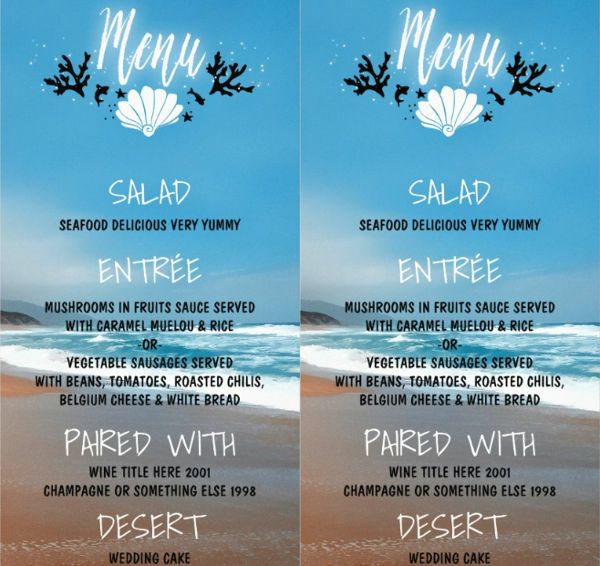 You can look for Birthday Menu Template for ideas and just tweak some parts of it to make it appropriate for your wedding menu. 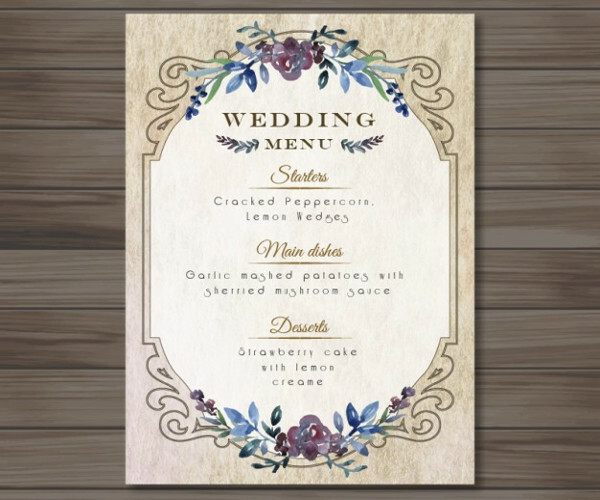 As mentioned previously, there are multiple places where you can put your wedding menus. It can be at the start of the buffet, printed out in a large size that everyone can easily see. It can also be on each table for per plate serving. 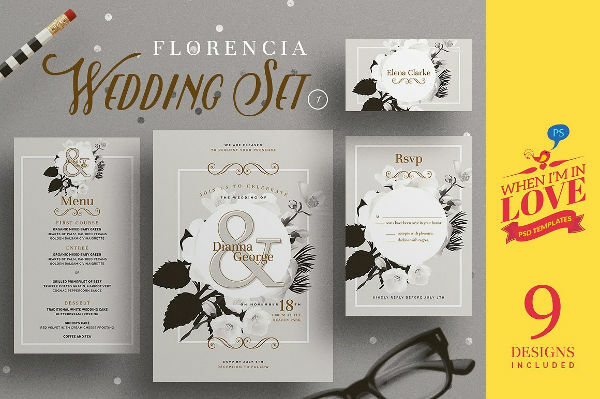 One more option is to insert it ahead on the invitation. Aside from the food menu, you can also make a separate wine menu template that is solely for the drinks served during the night. Your drink menu can be placed beside the food menu or you can just place it near the drinking station. 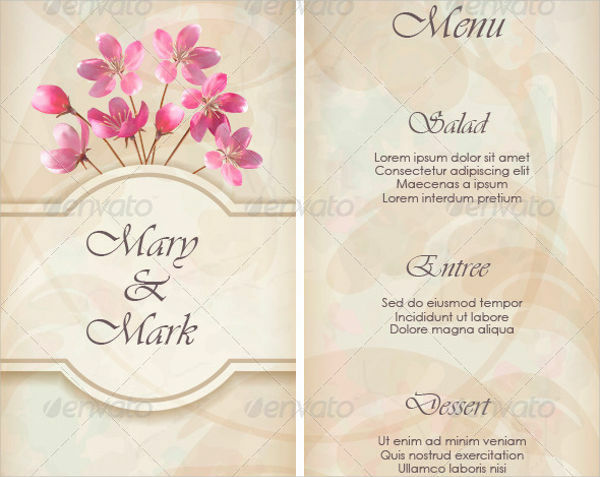 Now that you know the importance about menu cards, you also have to understand how the wedding menu itself should be. Although the choice of food is up to the couple, you still need to put into consideration those that are attending the celebration. So, read this very short guide to know the things to remember. Choose dishes that are less prone to allergens. Think about guests who might have allergies and specific dietary restrictions. They end up not eating at all because you chose dishes full of allergens. To avoid this, select food that are less likely to trigger allergies. Taste the dishes before you choose to add them to the menu. Take advantage of food tastings to actually experience the dish. Don’t just choose a dish because it sounds fancy. Remember that flavor trumps fanciness. Give options for guests to choose. You can have two options for your menu in one card. This will allow your guests to choose which set they would like better. Not everyone will have the same taste as you. Remember that at the end of the day, it is still your wedding.